Our Season's Readings Contest has begun! I am giving away a signed copy of either Dead Between the Lines or Murder of an Open Book—winner’s choice. Leave a comment today or Thursday and on Friday I will pick a random winner! Sorry! U.S. entries only. Hi! My name is Steph. When my husband died, I discovered that he had drained our savings and cashed out all our investments, leaving me with a couple thousand in our personal checking account and not much else. A while back, I had lost my job as a reporter and because I had decided to write the great American novel instead of seek other employment, Kevin’s death left me close to penniless. Having few other options, I moved in with my mother, Millicent Spicer. After my dad divorced her, Mom used most of her ready cash to buy a house in Bellbridge Estates, 55+ gated community. If the development had been what the advertisers promised, all would have been well. But it wasn’t and Mom was nearly as short of funds as me. At first, we hoped the developer would make things right, but when he was killed (A Finger in Every Lie) that possibility was off the table. Although it wasn’t fun being the chief suspect in the guy’s homicide, it was pretty cool helping the police figure out who really did it. Now that the president of the homeowners association has been murdered, the deputy that worked the other case has asked me to help him solve this one too. Either that or he’s asked me on a date, or both. I’m not really sure. As usual, I want to get every new book you put out and add it to my collection!!!! Please pick me for either one. Love your Scrumble River and Dime Store series. This sounds like another winner. mlarkin at rmrgroup dot com. 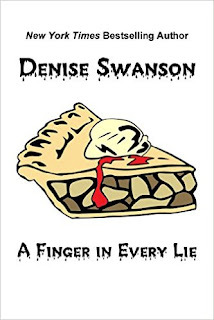 Hi my name is Lois Rotella and enjoy Denise Swanson's books. Looking forward to the new Scrumble River and Dime Store books. Thanks for the chance to win. Will have to check out more of Stephanie's story and see what transpires! I'm a big fan of Scumble River! Thanks for the chance to win! Can't wait to see if it's an interrogation or a date. What a delightful heroine. Sounds like a good read. Want to know if it's a date! Thanks for the giveaway. A new series? Sounds good! I enjoy your books!! Thanks for the chance to win this book! Sounds like a fun way to start a new relationship. Thanks for the contest. Everything you write is so good! If it has your name on it I will read it...with a smile! Men can be so confusing! I love the idea that she isn't sure whether he's asking her to help and/or on a date! Anything by Denise Swanson is fun reading. Sounds like a fun series. Thanks for a chance to win. I love book giveaways. Not sure which book I'd choose; I'd have to look at the excerpts on Amazon. Love your series and this new one sounds good too! I would love tos tart this series. Thanks for Holiday giveaway. Looking forword to reading your new stories. Sounds like a wonderful read! Thank you for the giveaway. This series sounds fun! Thank you for this chance. Thanks for this chance. Sounds like a series I'd love! Love Scumble River Series and am looking forward to reading the others! Love your Scumble River Series and look forward to reading your other novels! I used to hate short stories but now I like them. This one sounds great! Thanks for the giveaway. Would be a great birthday surprise! Thanks for the opportunity! You continue to give me so much reading pleasure! Thank you so much! Love your books. Merry Christmas.